A Scottish style malty beer brewed in the style of some of the Scotch Ales of yesteryear. "Wee Malc's" is a medium chestnut colour with a deep caramel and vanilla flavour and aroma. This beer is not too bitter and is the perfect accompaniment to hearty rich stews and casseroles, or indeed Haggis Neeps and Tatties! The tartan on the pump clip is "Irving of Bonshaw Tower" Tartan. 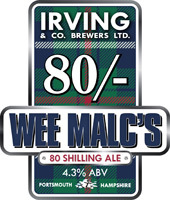 Wee Malc's 80/- is available from mid January through to mid February.